Eating a variety of fruits and vegetables is super important …and our kids should be no exception to this rule! So let’s start the school year off right by packing a wide variety of colorful produce in our children’s lunches – and I am not just talking about a rotation of apples, grapes and carrots. Today we are talking about a fabulous (colorful) fruit option that holds up really well in the lunch box, and that’s berries! Not everything looks appealing after being tossed all around on the way to school, but I think berries hold up beautifully and they also work well in recipes, which is why I am excited to partner with Driscoll’s on this post. And let’s face it, berries by themselves are basically one of nature’s fast foods with no chopping or peeling required. If you saw my recent post on “Thinking Outside the Sandwich,” you know that I’m all about coming up with some creative ideas other than just the predictable PB&J to keep your kids interested in trying and eating real food. So I think you’ll be excited about this new berry recipe below – Raspberry Almond Lunchbox Waffles! You can send it as-is with a yogurt or maple syrup dipping sauce, or spread some organic cream cheese on the waffles to make it into a sandwich. My daughters absolutely love this variation, and I love feeling like I am packing something fun and different instead of an old stand-by. 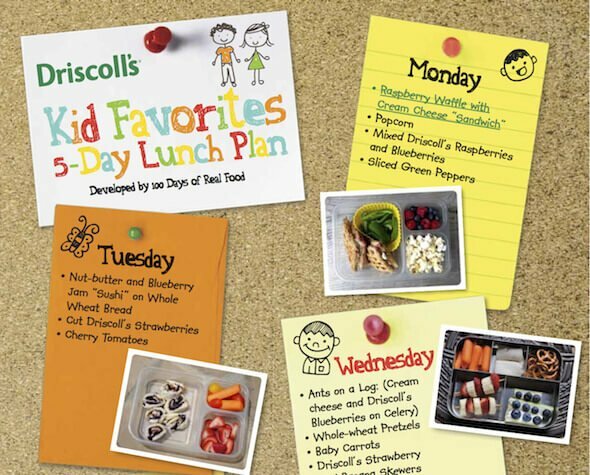 Visit Driscolls.com or click the image for the full school lunch meal plan. 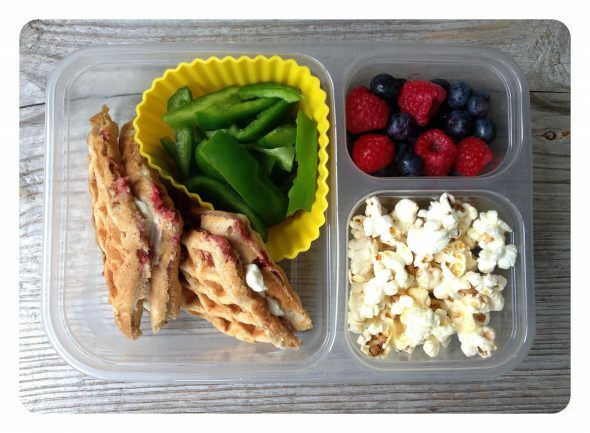 What is your favorite way to pack berries in your kids’ lunches? In a large mixing bowl, whisk together the flour, baking powder, and salt. Make a well (hole) in the center of the flour mixture and drop in the eggs, milk and melted butter. Stir to combine. In a separate small bowl mash the banana with the back of a fork. Carefully fold the banana into the batter along with the raspberries and almonds. Cook the waffles according to manufacturer directions and either serve warm with pure maple syrup or use the waffle pieces as “bread” to make a cream cheese sandwich for the lunchbox. Previous Post: « Video: A Tour of My Kitchen! Plain, just berries. My daughter just loves strawberries, raspberries, and blueberries. Sometimes in a smoothie too. How do you make the skewers with bananas and not have them turn brown by lunchtime? If you slice/skewer them in the morning they should be okay, but if you’re worried about it you could substitute melon or grapes! Any suggestion on a banana substitute? My daughter is allergic, but otherwise these sound delicious. Grapes, cheese or melons would be great on skewers! But what about the banana in the waffle? What can I sub for the banana in the waffle? I am excited for this new waffle recipe! 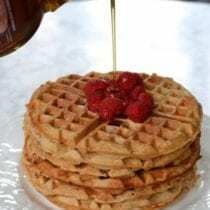 My kids just love making homemade waffles (they are good at working the waffle iron :)) and we usually have them for dinner a few times per month. Looks amazing but we are gluten free. I haven’t been to this site in a long time due to no gf recipes. Everything is whole wheat. Does anyone know how I can change this recipe to gf? My sons miss your whole wheat waffles. Thanks. We usually buy this brand of berries for the kids meal and they love it. However when we wash them and pack them for lunch – it’s often not eaten up as the raspberry gets all mushy. My question is do we have to wash the raspberries if they are organic? If they served straight from the box, they do retain their shape and texture. Thanks! Alice – I do like to rinse all my produce, and I find that raspberries do especially well when mixed with yogurt in the lunch box. My sons school is nut free. Can I just omit the almonds or substitute for something else?? New to your blog and loving all the ideas!!! Yes, you could just omit the almonds – or if you want to experiment you could try adding sunflower seeds. I love all of your recipes! Thank you so much for all of your hard work to make my life easier! I was wondering if you have nutrition information for your recipes anywhere. Thanks again! I am glad you are enjoying the recipes! And no, I don’t post nutrition information because I feel that part of eating a real food diet is not tracking numbers, but instead eating a variety of whole foods and listening to your internal cues to stop eating when you feel full. What if you don’t have a waffle iron? I have not tried it myself, but you could try this as pancakes. Let me know how it turns out! I made them today as pancakes and they were great…. however when I put the leftovers in the fridge and pulled some back out tonight, they didn’t taste as good. I know you said you pack them for lunches… do you make them the day before or the morning of? Wondering if they weren’t as good since it was pancakes instead of waffles? What kind of waffle maker do you use? I like that your waffles are flatter… The one I have makes very big thick waffles, which is good, but not good to make sandwiches with. I have looked everywhere for whole wheat pretzels – what brand do you use and where do you find them? Trader Joe’s has 1 option and so does The Fresh Market (Unique brand sprouted splits). Unique Pretzels can be found at Kroger,Wegmans, and Amazon. These look lovely! Thanks for the lunch ideas! I think blueberries would be the better option out of those two alternatives. I made these with frozen blueberries, came out great! And by fresh you mean frozen since fresh are only available like 2 months a year. Would we need to de-thaw them first or would it be okay to dump the frozen in the batter and away we go? I used fresh in this recipe, but I think frozen would work just fine! I use frozen raspberries in my muffin recipe and they turn out great. Thanks for sharing! I had a busy morning in the kitchen with the recipes from your cookbook. I made Berry Sauce, The Best whole chicken in the slow cooker, Cinnamon Raisin Quick Bread and Mini lunch box quiches. I love the cookbook! Hi – can you freeze these waffles once you make them? I would love to make these for sandwiches but there is no way I would have time before school to do that! I guess if I froze them, then I could take them out the night before, spread the cream cheese on in the morning, and then put in her lunchbox for lunch that day? These sound great! For the strawberry/banana skewers, how do you keep the bananas from turning brown? I have tried sending raspberries to school, but they end up getting a little squished and then my oldest won’t eat them. I send strawberries whole, in fruit salad with blueberries and watermelon or cantaloupe, or on skewers with grapes and a piece of cheese cut out with a cookie cutter. Oops, I see that question was already answered. I am enjoying following your blog and helping to make better choices food-wise for our family. I stumbled on your blog as I have began sending my son’s lunch with him almost every day to school. I was sick of the processed foods that they were serving at school and him coming home starving every day. I do have a question for you though…when sending warm foods with your kids to school, how do you keep them warm? Thank you again for all of your great ideas. They are a great tool for my toolbox for our healthy family. I have a couple off topic questions as well. Do you actually can ( boil and seal) your ball jars of soups that you freeze for school lunches? If so, why do you freeze them. Or can I skip the after filled step and just sterilize the jars, fill and freeze? Also when I add coconut oil to my waffle recipe it turns solid because of the cold milk. How do you handle this? I love my cookbook and hope I win the 20 minute skype!! Lisa, currently are the FDAs sugar recommendations including naturally occurring sugars as well as added sugars? I’m guessing it does and as long as your kids are eating mostly natural occurring sugar you don’t worry too much about it. Am I correct? My kids eat almost no added now but they get plenty of fruit in a day. Hi! I wanted to ask a question regarding milk. In the book it says to use full fat milk but in an article you wrote about milk you said you and your family drink 2%. I just wanted to know which one is best? Can you substitute the whole wheat flour for either almond flour or coconut flour? the recipe looks great and can’t wait to make it. I too have a couple off topic questions. 2. What suggestions do you have for morning sickness? With my last pregnancy I could only consume enriched white flour bagels, ginger ale, and Mexican. I pretty much would lose anything else after eating it. But obviously I really want to not consume the first two items. I tried all kinds of ginger last time. It just made it worse. Any suggestions you have would be much appreciated. I have been slowing reworking our eating habits to try to make them at least 90% real food and have really learned so much from your site. I hate the thought of moving backwards. Thanks for the lunch ideas (and that 3 are meat free :). My son just started kindergarten and I’m packing lunch + 2 snacks a day. Would love to see MORE meat free real food lunch ideas. I was wondering what I could substitute in place of the banana? My youngest is allergic to bananas. Also wondering if I could use almond flour instead of wheat? what brand/kind of waffle maker do you use? This looks so delicious. I would love to make this for the kids I get to babysit, and myself ;-) Thank you for sharing. Just started reading on your site tonight. Looking for ways to feed my family better. Just wondering how a day of eating might look for you all. Is it 3 meals, no snacks. 3 meals 3 snacks, etc… and what are your families go to’s for breakfast, lunch, and dinner. Looking forward to getting your book in the mail and starting to make some changes around here. Fingers crossed my little guy eats no fruits or veggies. He will have a smoothie every once in a while. Its going to be a big week over here. Thanks for the great site and inspiring us moms!! !